Build or BOOM is a two player challenge game to bring fun and test speed and balance. Designed for kids ages 4 and up the game helps to develop analytical thinking through block building, shapes, colors and balance structures. 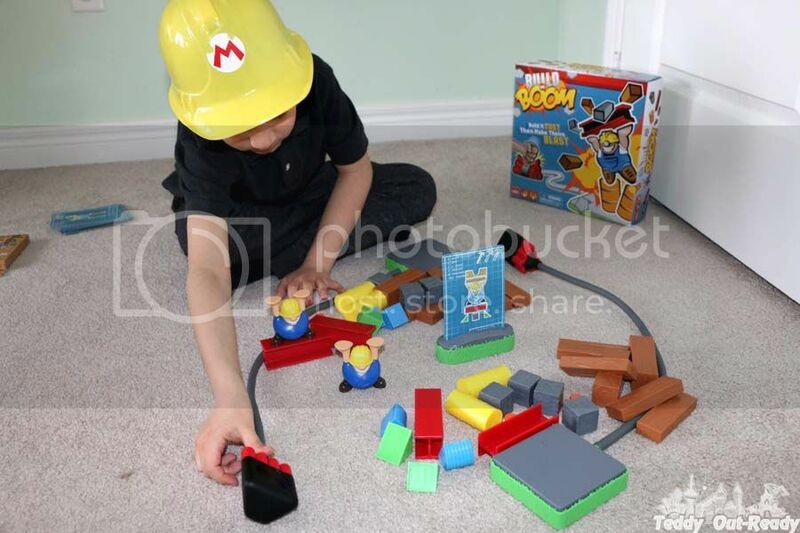 Build or BOOM is easy to play and do not require any batteries or digital devices. Two players have the game area set which can be on a table, floor or other flat surface. They put all the game blocks available like barrels, arches and triangles in the middle of the area. 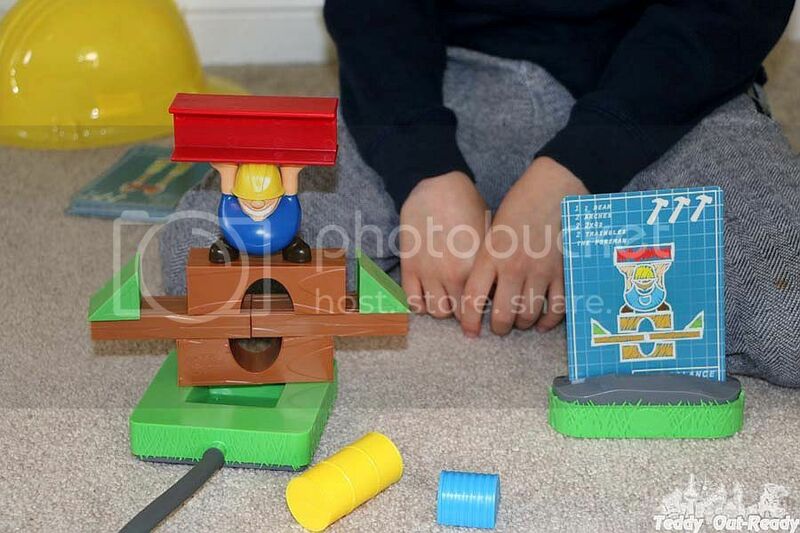 Each player has a building pad for structures and it is connected to another player using air hoses. There is a pack of blueprints cards, every turn players put one card in the middle of the playing area in a card holder. They have to follow the instruction drawn on a card and build the structure shown. 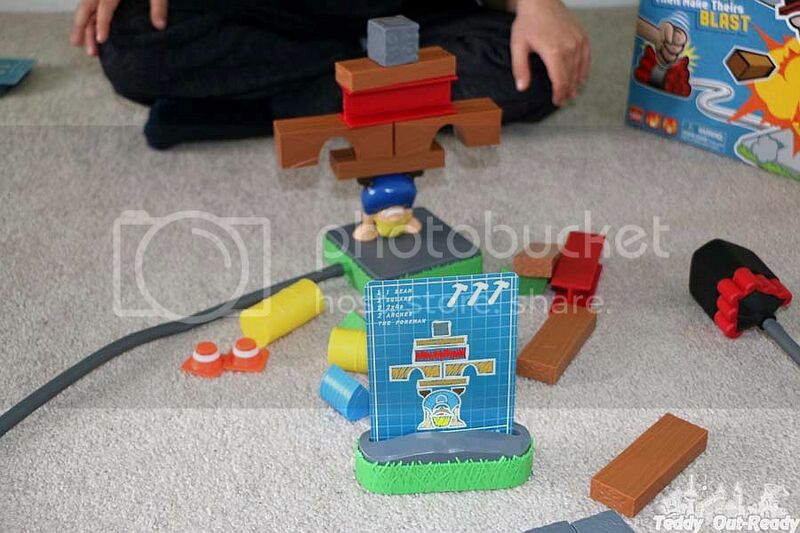 The first player who builds the structure, smashes opponent's construction site using a boomer. The winner has not only to be fast to build the structure, the building blocks have to be stable and set as shown on the blueprint card. The person who wins 10 times becomes the final winner of the game. We had really fun time playing Build or BOOM. The game has four difficulty levels of building structures. While at level one it was simple to build everything, trying level three was quite challenging. Balancing the whole structure was not very easy especially when you have to build it high using many blocks and tricky sets. Teddy once had a hard time balancing two arcs on one block and the structure kept falling until he figured out that it should have come with extra block on top altogether to balance his structure. Players have to be fast to win, and do not forget to smash your boomer so that opponent's structure tumbles down. The BOOM part is the funniest when blocks are flying through the air and the room is filled with laughter. I think this game is perfect for both kids and adults. Teddy played with his uncles and cousins, it was totally fun! 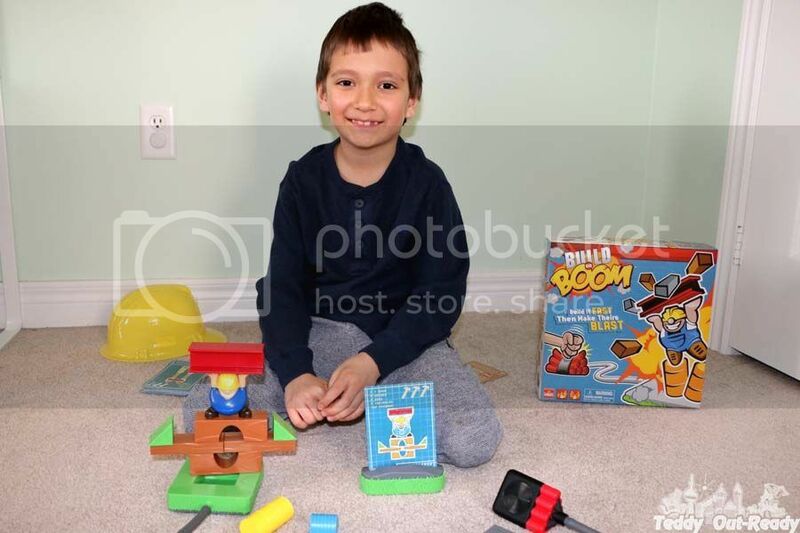 Build or BOOM game is available at Walmart, Amazon, ToysRUs, Mastermind Toys and other toy retailers across North America. There are extra blueprint card sets sold separately. They offer more difficult levels to build as well as the opportunity to create own card creations using special stickers.